BoF (Birds of a Feather) sessions are held at RIPE Meetings to start an informal discussion on a topic of shared interest among RIPE Meeting attendees. If a BoF attracts sufficient interest, it might become a RIPE Working Group or Task Force. BoF’s have been scheduled during RIPE 64 on Monday, Tuesday and Thursday, end of day in the White Hall. This BoF will take place in the Grand Union Hall. The Internet Routing Registry Toolset (IRRToolSet) is a suite of policy analysis tools to operate with routing policies in RPSL format, which are registered in Internet Routing Registries (IRRs). The toolset is used at various (large) networks/ISPs but is considered complex and laborious to deploy. Hence some alternative toolsets have been developed that provide an easier path to use of RPSL with router configuration. With the organisation of the BoF, we want to explore the interest of the community in a successor for the toolset and get feedback on requirements for such a next generation toolset. As discussed on the irrtoolset mailing list in the past years, issues such as maintainability, modular design, redesign of front/back-end code, output formats for integration with business operations, distribution of IRR data and router configuration can be subjects for discussion. This BoF will take place in the White Hall. RIPEstat is a toolbox designed to offer easier access to datasets maintained by the RIPE NCC and others. The project is developed incrementally, in cooperation with the community. Regular demonstrations are held to reveal new features and report on ongoing development, and to hear feedback from our users. This live demonstration is an opportunity to pose your questions directly to the developers, and learn more about RIPEstat firsthand. This BoF will take place in the Blue Room. The RIPE NCC Executive Board wish to engage with RIPE NCC members and other RIPE Meeting attendees during a Tuesday morning light breakfast hour to discuss the organisation and its services. Roundtable discussion on experience and issues Open Source Routing Software Quagga and Bird. This is a BoF for users, developers and anyone else interested to discuss and hear what’s going on with the popular Open Source Quagga and Bird Routing Software. Martin Winter from OpenSourceRouting.org (working on Quagga) and Ondrej Filip from CZ NIC (working on Bird) will lead the BoF. There will be a short presentation from both of them on what they are working on, but don’t expect a long presentation – the goal is to have an active and open discussion on directions, vision and issues using Open Source Software for Routing. Want to learn more about RIPE Atlas user-defined measurements? Come and talk to the developers and beta-testers to exchange experience, discuss the new features you’d like to see, and help us prioritise our efforts to build your RIPE Atlas. 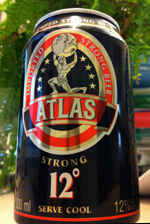 And, if you’re lucky, you might get to taste one of the limited edition Atlas Beers we’ve got on offer!